It tasted a lot better than it looked. :) The idea was hatched after thinking about a paella in the context of our lechon menu. So off to the kitchen to experiment… In a small cast iron pan, I fried up some homemade chorizo with a touch of pure lard. Once it was cooked through and slightly caramelized, I removed the chorizo and left the lard and bits in the cast iron pan. In a separate pan, I heated up some lechon dinuguan (all lechon meat, no innards), added a touch of coconut cream, two chopped siling labuyo (bird’s eye chilies) and brought this to a simmer. I added several cups of steaming white rice, and salt to taste (it needs quite a bit of salt, as the rice deadens the seasoning) and mix until everthing is a uniform color. Add the excess chorizo fat from the cast iron pot, a bit of chili oil if you like it, and stir to combine. Are the orange things on top the home made chorizo? I’m sure that even if it’s paler than the commercially available red ones it’s still packed with the same flavors minus the MSG and other bad stuff. Hmm, I don’t eat dinuguan and though this version is less gross, I still wouldn’t be tempted to try it. But for folks who do I think that this would be appetizing. Maybe saute uncooked rice with chorizo/ lard, then add dinuguan plus a little lechon broth to simmer until rice cooks. Then it would really be paella instead of lechon dinuguan rice. 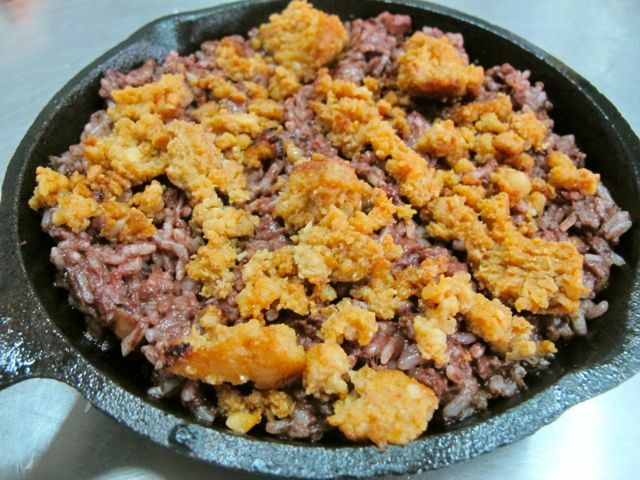 How about adding some chopped chicharon for the resulting Crispy Dinuguan Rice??? YUMMMMMMM! I want more cubes of fat :) I also want more toppings side from the chorizo. Thinking of crisped up lechon and crumbled chicharon. MarketMan, Moni and ChrisB are witnesses to my unforgiving assault and consumption of the fatty piece of slow-cooked adobo at Zubuchon. My most recent lab test last month show very nice cholesterol (Total, HDL, LDL, triglyceride) levels. All within range… But of course my Uric acid soared and my blood sugar is a testament of my being from Negros Occidental. Lydia P, seconds after taking the photos above, we added chopped chicharon to the dish, and it was a nice addition, but could be a bit OTT. Mimi, the blood would coagulate if it cooked for 20 more minutes for a more real paella, I think. ami, yes, we make our own chorizo — less blobs of fat, no artificial flavorings or color, no preservatives… just paprika and a touch of achuete oil for color, sea salt, vinegar, garlic and spices. Natural casings as well. I think that preparation is the only way in the world to make diniguan look remotely appetizing. Absolutely brilliant!! We should coin a new word for the dinuguan flavored socarrat. Hmm, “socarrat de sangre”? That looks delicious, MM. Chorizo and shrimp! but in smaller pieces. Sorry but I find this rather gross. But I’m not really a fan of dinuguan to begin with. I adore lechon and other native foods you’ve featured and sometimes tweaked, but with dinuguan I’ll pass. I wonder what goes into the kamias shake? Does it have milk? I’m going to try and see if I can get frozen kamias from our suki Pinoy store here and try to recreate the kamias shake. Kakainggit eh. I would order this! With a kamias shake on the side to help cut through the umay. Though I believe this tasted great. I still love my dinuguan topping warm perfectly cooked rice. Heavenly! 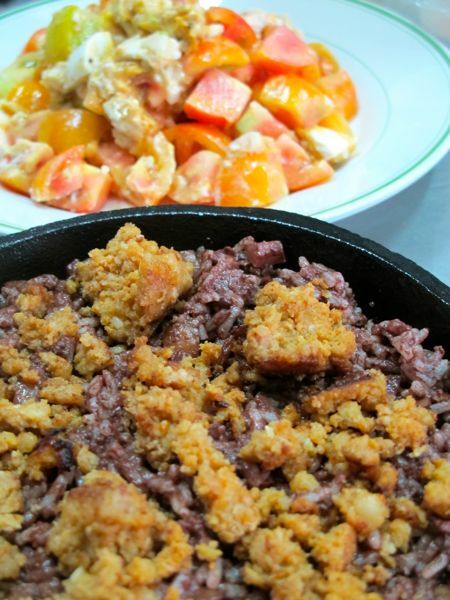 :D I imagine the "tutong" added the extra texture to make it more paella than mixed dinuguan rice? Joseph…I asked the same question few months ago from MM about the iba shake. Frozen kamias doesn’t cut it esp. the color. MM gave me an alternative fruit to try but it is not in season yet. At least, I haven’t found them in stores. Go on Fraser St. and a few stores from Aling Ening…a Pinoy grocery store (can’t remember the name). She brings in fresh Pinoy mangoes and one time, fresh UBOD! So, if you ask her, maybe she can get fresh kamias though I am assuming it will not be cheap! mama mia! i can imagine the taste :) lime wedges on top perhaps? Looks so delish! My mouth is salivating while looking at the photo. I will definitely try to cook this. Just not sure if my Aussie hubby and son will like it. Kinda reminds me of “arroz y morcillas” of Dulcinea. Sayang wala nang ibang pics of the other cooking stages. nyahaha, malapit na kaming dumating sa cebu so a inner at one of the zubuchons is in the itinerary……….. I would vote for bits of lechon skin and/or lechon flakes. And slices of green mango or thin slivers of kamias on top… to combat umay. This does not not gross me out at all as I love to add rice to the saute pan/pot right after my Mom has transferred the dinuguan to a bowl. That way I get every morsel of the left over dinuguan sauce and it is enough to satisfy me. Maybe leave some minced dinuguan meat to the mix and some bits of crushed chicharon to add some color. This is a fantastic idea for a paella, I must’ve tried all the paellas at the Salcedo Weekend Market but none of them have thought to come up with more adventurous paellas. Not a fan of chorizo but I’m willing to give it a try. Love that you have itlog na maalat and kamatis in the background! Oh wow! I don’t eat a lot of dinuguan but I can see how this can be a good idea. I think that the dinuguan’s slightly metallic taste and sourness works well with rice and when combined with lard and chorizo..YUM! it just needs a few slivers of the green finger chilis used in dinuguan. now i’m hungry again.. I love dinuguan and I rarely satisfy my cravings. My mah can’t do the dinuguan right and there are no decent Filipino Restaurants here in Sydney. You see I was born and bred in the Philippines up to the age of 8, so I remember my favourite foods and I had loved Dinuguan and dig into it with gusto, I don’t care who’s watching and even if they’re grossed out hehehe! I don’t care what it is made up of it’s freakin heaven that’s for sure..
Force it into a casing and you have blood sausage. Hi MM, i’m new to this site but i’m hooked to it already, i enjoyed reading all your post and the recipes that you and your readers posted, Just curious do you have a any recipe on how to make those steamed rice with pork and shrimp Ding How Dim Sum style. Thank You. Love this idea Market Man! But now matter how yummy it is, dinuguan isn’t so photogenic…sadly not even as paella. going home to cebu for the holidays can’t wait to get to your new zubuchon resto. If that paella is there, it is something i must try. It sort of sounds like a wonderfule cross between squid in black rice and paella, wonder why I never thought of that before . . . hmm . . .